Pattern includes fully charted design, schematic, yarn selection information, sizing information, i-cord cast-on instructions, and lovely, full color photos. 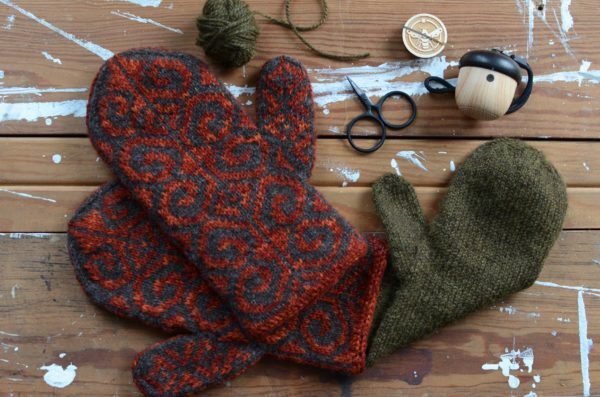 Stranded mittens with sore thumb and a traditional mitten shape, knit in decidedly non-traditional yarns, fibers, and colors. 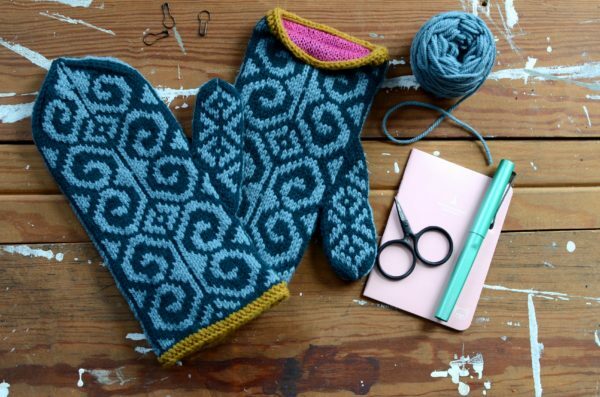 These are a quick and fun knit! TO FIT: 7.5” (8.25”, 9”) palm circumference. If you are between sizes, knit the closer size. NEEDLES: 3 (4, 5) US, or size needed to get gauge. GAUGE: 28 (26, 24) sts. and 30 (28, 26) rows = 4” in colorwork pattern. Gauge is critical for proper fit! 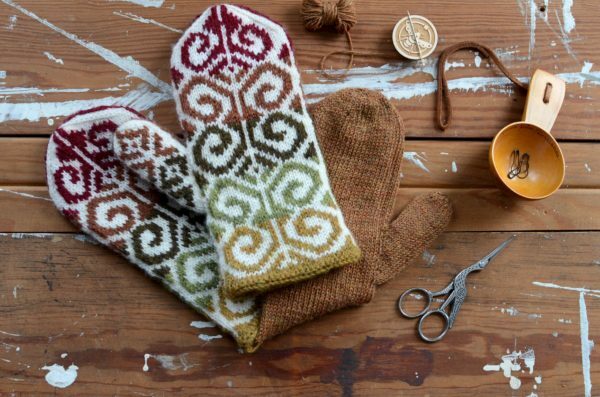 This pattern requires sport or DK yarns for the outer mitten. You will use approx. 125 yards of MC and 40 yards each of 5 CCs. Count on using approx. 140 yards of a DK or sport lining yarn, as well. Sport lends itself to the Small size and DK to the Large, but they both work for all sizes. Choose a plied wool or wool blend yarn for optimal warmth and sturdiness. Treat yourself to the most scrumptious lining yarn you can find. Some samples shown have been knit with one main color and 5 contrast colors. The chart will show you when to change colors. You do not need to knit these in 6 colors, however. Two colors will do nicely! I can see these in black and white, subtle combinations like blue and grey, or a solid main color with a self-striping contrast yarn. The mittens shown first were knit from Cascade 220 Sport- MC – 8010, CCs, 4010, 2452, 9459, 2453, and 2401. The lining is Berrocco Ultra Alpaca Fine in Tiger’s Eye Mix. The mittens shown second were knit from Rockwell Monos, which come in 140 yard/57 gram skeins (half size) and used nearly all of each skein for size L. The colors are Orange and Natural 2016. The mittens shown third Brooklyn Tweed Arbor in MC – Treehouse, CC – Rainier, with a dash of Klimt in the edging and Misti Alpaca Lace in color C776 (sadly discontinued) for the lining. It is expected that you have some experience with knitting in the round, stranded knitting, picking up stitches, decreasing and increasing, and reading a colorwork chart. The pattern is a bit chatty, so should be suitable for an adventurous beginning colorwork knitter.